I am assuming this Ebay auction for a dubious American Eagle Shaped piece of Bacon is a joke. If you're interested the auction is only live for the next 6 hours. Or if you prefer, I'll send you an entire piece of bacon shaped like a strip of bacon from this mornings breakfast for the amazing price of only $10. 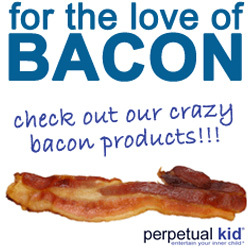 Seen anything interesting in your bacon lately? Lol, omg, they are so dreaming. $20 dollars for an piece of bacon *shaped* like an eagle? No thanks. It may be more rare, but I can get a whole new package of bacon for under twenty bucks! Wowz, all this talk of bacon makes me hungry.